Talat, Mansoureh, and Farnaz were among the organizers of June 12 demonstrations. They are also part of One-Million Signatures Campaign. Farnaz also runs an active feminist blog in Persian. I hope they’ll be released as soon as possible. It’s amazing how this government is afraid of feminist activists. Evin prison is where high profile political prisoners are being kept. While it’s a relief that at least it’s known where they are being held, still it is worrying that why they are being treated as political prisoners. Shirin Ebadi, Leila Alikarami and Nasrin Sotoudeh have accepted to be their attorneys. I hope they will be released soon. You can see their photos here. *Update: They are released on bail. Their attorneys still don’t know what their accusation is. No matter how down I am these days, still it feels great to be a Florida Gator! Gators rocked tonight. Yes, we are the champions! 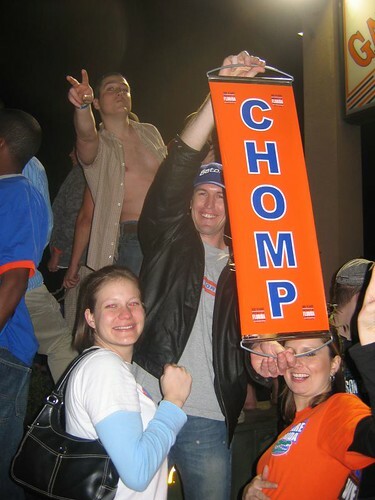 Check out our photos from the crazy fun night at Gainesville’s University Avenue. I found these videos (one – two – three) in Youtube. I’m sure there would be more soon. And it was so much fun to watch the game with her! Go gator girl! It was a bad year, because it ended with Saddam’s execution. Don’t get me wrong, I’m not a fan of Saddam. In fact he was among he few people I hate in this world (and note that I believe you should not hate anybody, even your enemy, because hate it destructive and poison you from within, but still I can’t help hating some people such as Saddam and Iran’s government.) But still I got sad Saddam was executed and I think it was wrong, very wrong. I was seven or eight year old. Me and some of our neighbors’ kids had an English tutor. That day everything looked different and our tutor left early. I heard we are going to be bombed. I didn’t know what it meant. And then it started. Sirens, Red siren it was called… we had to run toward the corridors of our building where we were told is safer than other parts of the building. We heard bangs, explosions. Tehran was under fire. Sounds of bombs and anti-aircrafts were shaking our strong reinforced concrete building. We kids were playing and singing. But my mom was reading the Quran worriedly. Her heart ached. Some of our neighbors were really feeling bad. And I got familiar with the scene. We got used to the Red siren. I never forget the day the last round of attacks started. My mom was out having toys for orphans fixed . My dad told him not to go because there were going to be attacks. But my mom who is very stubborn went out. And the missile attacks started. We heard one of the missiles hit a street near the area my mom was supposed to go. And she didn’t go back home. We waited, it was 9 o’clock, then 10 o’clock, then 11 o’clock. I didn’t want to even think about anything. Finally my mom got back at midnight, telling us what a chaos it was and how she couldn’t find a taxi to go back home. One afternoon I heard that my fourth grade teacher’s sun is killed in the war. Afshin Nazem was a Sharif University student and teacher. I never forget the night they brought his clothes home. His sister was smelling them and crying. I was hiding behind the columns of the building crying. And my brother-in-law’s brother’s body was found two months after my sister got married to my brother-in-law. My brother-in-law’s brother was disappeared for 12 years. He was 17 years old when he got disappeared in the war. He was a volunteer going to the front. He got killed in Shalamche and his family were hopeful that he was a prisoner of war in Iraq. But the remains of his body got back home after 12 years finally. I never forget my brother-in-law’s mom’s crying. I never forget their faces. What a great family. You can’t imagine how much I love them and how much I hate seeing their suffering. Why Saddam shouldn’t have to be executed? First of all, who are we to take someone else’s life, even a monster like Saddam? Violence grows violence. One day we should learn that. One day we should stop killing people for whatever reason. We don’t change anything with executing the criminals, nothing. Second of all, Saddam had to be held accountable for hundreds of other crimes he committed as well. It was too soon to end everything. He had to be questioned for killing his own people with chemical bombs in Halapche. He had to be held responsible for attacking Iran and Kuwait, for killing millions of innocent people. His trial had to continue for the sake of history. And the U.S government and some European countries had to be also held accountable for supporting him for years. Germany had to be held accountable for selling Saddam chemical weapons, the US had to be held accountable for selling him arms. Of course these things had to be buried in the history! So, he got executed so fast so that these issues wouldn’t be revealed. It was a bad year. I hope 2007 will be a better one. I hope the stupid deadly war in Iraq will end this year. I hope the US government stops killing for the sake of its “liberating” project in the world and leave the whole world alone. I hope we get rid of Iran’s government this year (yeah, told ya’, I’m drunk!) I really hope this year will be the year of peace in the world. Imagine!